It is our intent to make sure each guest has a positive and lasting impression. Monday through Friday, existing guests can bring a friend who has never been to Lenny's Hair Design and Spa and get two cuts and/or color for the price of one (from 9:00am til 3:30pm). Two first time guests can also take advantage of the same offer. Please mention this offer when you call to make your reservation. There is limited availability with this promotion. Once all reservations have been filled, we cannot extend the offer to any other date or time. For our Guest rewards program, existing guests must refer a person who is new to our salon. If you are new to our salon, you can bring another new friend to our salon to use this offer. Both reservations must be booked on the same day with the same service provider. You may bring more than one friend, as long as all reservations are booked together and fulfilled on the same day. Each person will receive a 50% off discount on the cost of their service.If there is an odd number of guests, one person may see a different service provider. Redeem one of our promo cards or show us this add on your phone or your electronic device and receive $10 off your haircut or$15 off your color service. Introduce our experience to your friends and receive $10 on your guest account to use toward your next service. * Guest Rewards may not be combined with any other Lenny's promotion. Every month we feature a specific product that blows us away, and we just have to share it! After all, what is the point of getting a new do if you are not able to maintain it after you leave our salon? We can give you the look, but it is the tools and professional products that are going to give you the power to do what we have done. Ask your service provider about our featured product of the month, and Save 15% - 25%. As a Premier Salon and Value Spa we believe the best is no less than you deserve. At LHDS we're here to see that you get it through our salon hair-care services. The best haircuts and pro blow-outs, and personalized color services. The best and latest classic scissor cutting skills and coupled with straightedge razor cutting techniques that we are privy to with being an Arrojo Ambassador salon. The best hair color services available using traditional foil placement along with today's trendy free hand hair painting techniques. The vibrancy, amount, depth, and contrast is always directed to enhance the guests look. Looking for that WOW factor? Look no further, book your color service with us today. As a Premier Salon and Value Spa, our spa services include everything you need to transform your look and radiance. The mark of an accomplished service provider is not merely the ability to give a satisfying facial or comfortable, pain free wax. It's understanding the skin from the cellular level, up to the surface. It’s the experience of knowing what the skin and body needs — to appear renewed, radiant, and more youthful. By these standards we believe your spa visit will be the ultimate salon and spa experience bringing you back time and time again. Pamper yourself with one of our luxurious, relaxing, and mind altering spa services today. You deserve it. 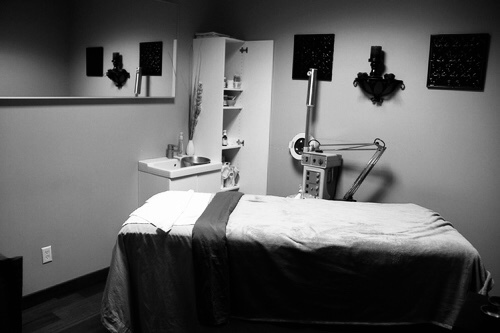 As a Premier Salon & Value Spa, LHDS delivers more than you might expect from a typical pedicure or manicure. With the best spa pedicure and manicure system for hands and feet, and the care of our talented nail designers you will leave your service feeling both rejuvenated and beautiful, with nails polished and painted to perfection. Rejuvenate tired hands and feet from our nail service menu, as we have manicures and pedicures and nail services to accommodate your time and budget.